Picture-postcard Burford on the River Windrush is the gateway to the Cotswolds. We meet our guide here and enjoy coffee and a local specialty – the deliciously naughty Burford Lardy Cake. See the ancient packhorse bridge, hear all about the Burford Golden Dragon and discover why the superstitious villagers of olden days would fill the river with buckets during droughts! Then by coach off the beaten track through little hamlets and villages nestling in gorgeous countryside and then we take you through the charming backwaters. There’s so much to see and so much you’d miss without our entertaining and knowledgeable Blue Badge Tour Guide. At Northleach, tucked away from the main tourist routes between gently rolling hills at a great Roman crossroads, we discover the Cathedral of the Cotswolds. The stone porch is possibly the most lovely in all England and the giant east window which floods the church with light is glorious. We stay here for a carvery lunch with coffee and there should be time to explore interesting alleys full of ancient houses that radiate from the old market square. 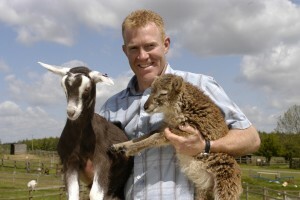 After lunch we sweep across the top of the Cotswold escarpment to Adam Henson’s Cotswold Farm Park. There’s always a lot happening in the all-weather display barns here. Seasonal demonstrations include milking, lamb bottle-feeding and sheep shearing and there are twenty-minute tractor safaris to see the wonderful views as filmed for BBC television. At the end of the afternoon we’ll be welcomed into the marquee for an entertaining short talk about the farm and the rare breeds including a question and answer session over a cup of tea (included) before heading for home by 5.00pm. The cost of this event includes luxury coach transport, your Blue Badge Guide for the day, morning refreshments, a two-course carvery lunch with coffee/tea, all entry fees and, of course, treats.